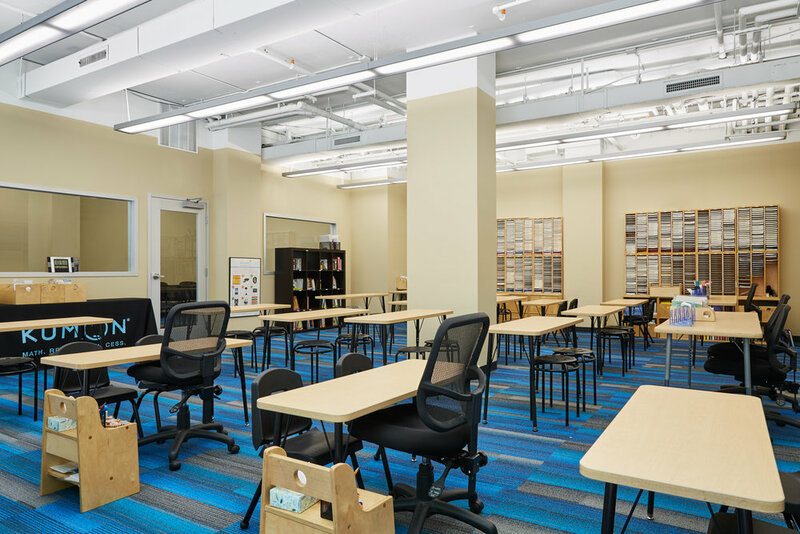 Kumon Learning Center is a 2,000 SF design/ build project in Chelsea, only one of the 42 centers, which are part of a New York City network. This global after school educational network is dedicated to the individualized study plan for students in the disciplines of math and reading. Instead of traditional classrooms, Kumon believes in the community building with the emphasis on personalized study plan that best suits a student’s needs in multiple neighborhoods. Our design intent follows the school’s educational philosophy, which is to encourage students develop their personal pursuit in a better future. The new study area is a bright open space that engages all students. In the communal study space, there are 18 desks each designed for small group discussion with a tutor, which creates engaging spaces for individual advancement in a group environment. The choice of main color scheme for the carpet and tiles consistent with the Kumon’s blue logo, which represents intelligence and honesty, as well as being highly durable and easy to clean, with state of the art lighting to provide the best ambiance for the students. For this build project we provided Architectural, Mechanical, Electrical and Plumbing Design Filing and Expediting, Project Management, Construction Management, Material and FF&E Procurement and General Contracting to meet Kumon’s budget and schedule, ensuring the most competitive cost efficiency and streamlined project delivery.